Before everything else we make sure we have a researched and well developed buyer persona. That always comes first. Then we get clear on what we’re writing about. We go through a content planning meeting (similar to this one outlined by DivvyHQ), where we come up with our theme for that month’s blogging efforts, ideas for individual pieces of content that fit that theme, and then finally titles for the individual pieces of content. It’s a good idea to create a style guide that will explain your brand and writing standards, and quickly bring any new writers up to speed. This article does a good job of outlining what a well rounded style guide encompasses. And here’s another one on the same topic. Next it’s time to select our writer, but finding them is sometimes like finding a needle in a haystack. It’s easier if you know the best places to look. Because we’ve hired writers for so long we now have a pool of writers that we turn to for most projects. For example, one of our clients had a special request for a writer with a number of years experience in their particular niche, and who took a journalistic approach to their research and writing. For something like that we looked at our network and were able to find a freelance writer who had recently left that client’s industry to pursue writing full-time. It was a great fit. However, there are special circumstances when we need to go search for new writers. In those cases, we developed a list of routine of strategies for finding content writers. The old saying “it’s not what you know, but who you know” still holds true. Reach out to the people in your own professional network first. Getting a referral for a tried and true writer will save you time and maybe even money if there’s some type of referral discount involved. Also, it can’t hurt to check with your college alumni network listserv and journalism school for talent. You use social media for everything else, so why not advertising writer jobs? Leveraging your social media fan base can help you cast a wider net for little or no cost at all. LinkedIn Groups are a great way to reach an actively engaged audience of potential writers. Announce your position in every group that applies and wait for the comments to roll in. Also create one or two targeted Facebook & Twitter Ads that link back to the job posting on your website. Connections and job opportunities is what makes these groups so appealing. Which is why most professional organizations and associations have an online job bank. You can post jobs on Editorial Freelancers Association for free. Target local chapters of the Public Relations Society of America, but be warned that it will cost you. If you need access to a quality pool of candidates, it’s worth it. There are a number of marketplaces you can visit to find quality content writers. We’ve written a comprehensive article on the topic here: 10 Places To Find And Hire Content Writers. Once we've found a few potential candidates we ask them to do a test article for us. When starting out with a new client we don’t know exactly what style or personality they will jive with best, so we typically find 3-5 writing candidates and ask them all to write on the same topic. We will pay for the test article so that the potential writers return their best attempt for us. All of the candidates write the same article (same topic, title, etc. ), and then we present the different variations to the client who reads through them all and picks the best two. The #1 choice is our primary writer and the #2 choice is our secondary writer. For us, it’s important to have a secondary writer in case the primary writer cannot meet a deadline for some reason (vacation, busy with other projects, life’s circumstances,etc.). It’s happened, and we’ve learned to always have a backup. Now that we have the primary writer, we can begin working on the content that's part of that client's particular campaign. Each article we write starts with an interview between the writer and the client. Our team will typically lead the interview, with the writer taking notes and asking questions when they feel inspired. We record the interview using Join.Me or another similar platform. In a 90-minute interview, we can typically cover 4 different blog articles (meaning we get the clients notes on 4 different articles). By the end of the call, the writer has enough information to create an awesome article. They walk away from the call with the following: their personal notes, the interview questions and answers, as well as the recorded transcript to refer to. Having written for clients myself, I can say that's incredibly helpful to have those three resources to refer to when you're writing. I tend to listen back through the recording as I'm writing the piece of content, to hear again what the client (aka the expert) is saying in their own voice and style. In my experience, this reduces the amount of revisions requested. Now the major work shifts to the writer. Our writers normally take 24-72 hours to return a blog article to us, depending on the length and complexity (and whether we send the request on a weekday or weekend). In writing platforms like Zerys, the writing, editing, and approval process is very straightforward. The writer posts their drafts into that project, we’re notified that we have a draft to review, we provide our feedback and the writer makes any needed changes, the draft is then sent to the client for approval (still within Zerys), they provide input, and finally the article is approved. After receiving approval, our Content Manager optimizes the article and schedules it for publishing. Ideally, you want the editing process to be as short as possible. Nothing’s worse than a multi-day back and forth between you, the client, and the writer. Everyone becomes frustrated at that point. This is why the previous 4 steps are so crucial: putting the time in on those steps gives you the best chance of receiving expertly written content that is on topic and useful. While this is our proven step-by-step process, you may find it’s necessary to add or remove a step depending on your organization’s workflow and size. No matter what you decide, make sure you document what works and what fails to continuously fine tune this process. Know your audience and style - develop serious buyer personas; come up with a content planning process that works for your organization; and make sure you have a style guide (or at least some guidelines) to hand to your writer. Use your network - reach out to your professional contacts for referrals; explore online writer marketplaces; and make use of your company social media sites to spread the word. Test the waters - send the best 3-5 candidates a test article to gauge skill sets, sample writing styles, and zero in on a top choice. Conduct a writer/client interview - create a list of interview questions for the client; and host a phone or in-person interview between the two; allow the writer to ask follow-up questions; use answers as research for blog content. Let the writing begin - let the writer take it from here; review the first draft within 24 to 72 hours; and make revisions as needed. 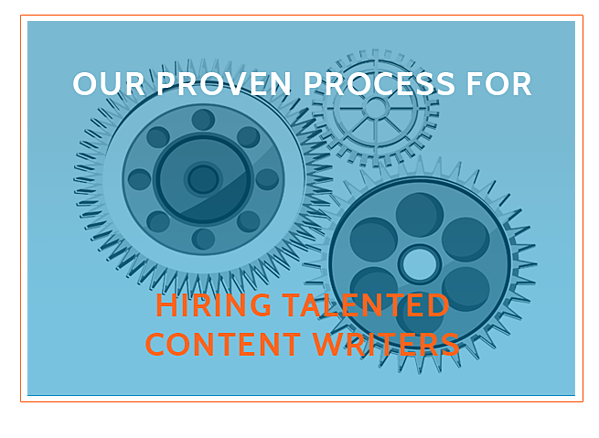 What’s your current process for hiring talented content writers? Tell us in the comment section below. We’d love to know what’s working for other marketers.